Detailed tips for supporting each style X Additional Thomas Kilmann info available at extra cost in auxiliary publications. Download original in PDF for $9.95. Buy rights to photocopy PDF for $3.95 per user copy. Thomas Kilmann not available in PDF. Buy rights to photocopy from print version for $17.95 per user. $45 - includes score report. No tutorial. Or $19.50 here. Online Basic Training Course for TKI available for $225. Detailed Trainers Guide Free 40 page download Trainer's Guide to Successful Conflict Styles Workshops. For training with online version see free guide here. Trainer Dashboard allows tracking of all users, option to delay access to scores, remote viewing of score reports, emailing of scores, easy aggregation of scores, and capacity to email whole group. No user management options. Information on Style Matters from www.RiverhouseEpress.com; on Thomas Kilmann Conflict Mode Instrument from www.CPP.com. Our goal is fair, accurate comparison. We would be grateful to be informed of - and will quickly correct - any points on which the above comparison is out-dated or does not meet these standards. View this on Slideshare. See also Wikipedia entries on Thomas Kilmann, Style Matters, and conflict style inventories. Many trainers using Style Matters today started out with the Thomas Kilmann. 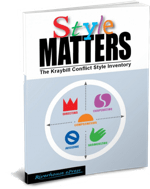 Read an assessment of the TKI and reasons why Style Matters author Ron Kraybill eventually abandoned it and developed Style Matters here. See also Kraybill's blog post comparing Style Matters to the Thomas Kilmann and the Hammer Intercultural Conflict Style Inventory.